Every year in the fall, it seems like there’s everything “pumpkin spice” or pumpkin flavored. It’s amazing the number of new pumpkin flavored foods that have come out over the past few years. But let’s get to something basic and truly wonderful and that’s made with real pumpkins – pumpkin soup. Not only it it very low in sodium, but it’s also extraordinarily delicious and super easy to make! 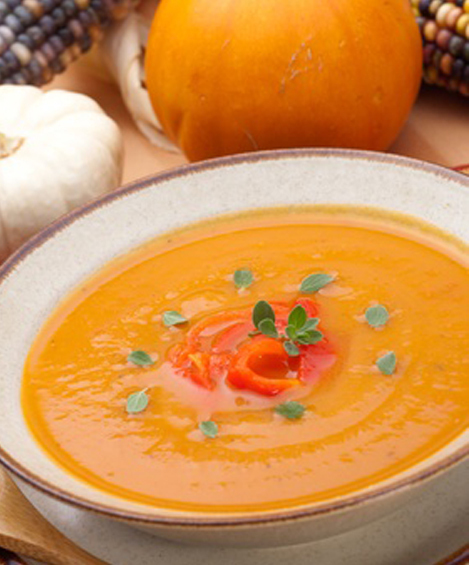 Low sodium pumpkin soup is made with just a handful of ingredients and we’re even going to make it easier by using a can of pumpkin puree. Don’t worry, it’s not cheating, just a step saver. You can always make your own pumpkin puree with these easy steps from recipeteacher.com. The flavors for the soup come from the low-sodium vegetable broth and a small onion, plus the spice flavors of nutmeg and cinnamon. We’re only using a small onion which will be tenderized in a pot so as to not overwhelm the other flavors, but rather bring out the richness in the pumpkin flavor. It’s really an outstanding combination of flavors, which all work so well together to create an absolutely scrumptious soup. And from start to finish, you’ll have the whole thing made in under 30 minutes. Trust me, you’re gonna want to make a few batches of this low sodium pumpkin soup. It’s one of the best soup recipes i’ve ever made. In a large saucepan, add 1/4 cup of water and heat over medium heat to simmer. Add onion and cook for 3 minutes. Add remaining water, pumpkin puree vegetable broth, cinnamon, nutmeg and pepper. Stir well while bringing to a boil. Reduce heat and let simmer for 5 minutes. Stir in milk and continue simmering for 10 minutes.